This entry was posted on August 28, 2018 by Allison Holland. 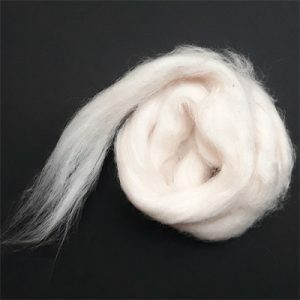 Dye-Lishus Cotton Sliver is an undyed, PFD (prepared for dyeing) cotton fibre that has been treated to accept dye colour directly using any dye stuff. The cellulose structure is changed so that it behaves as if scoured and mordanted in preparation for dyeing before it goes to the mill; there is no chemical added to the fibre. 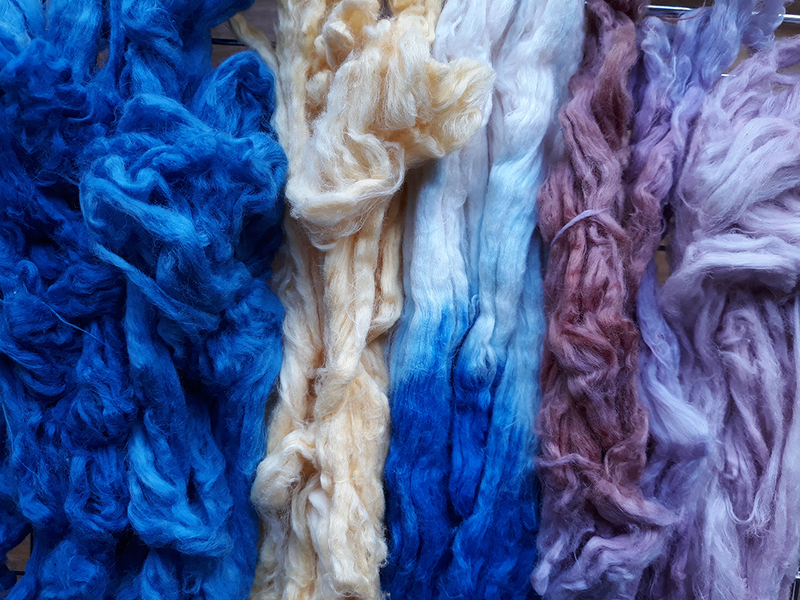 There is no need to use fixatives or mordants when dyeing Dye-Lishus Cotton. 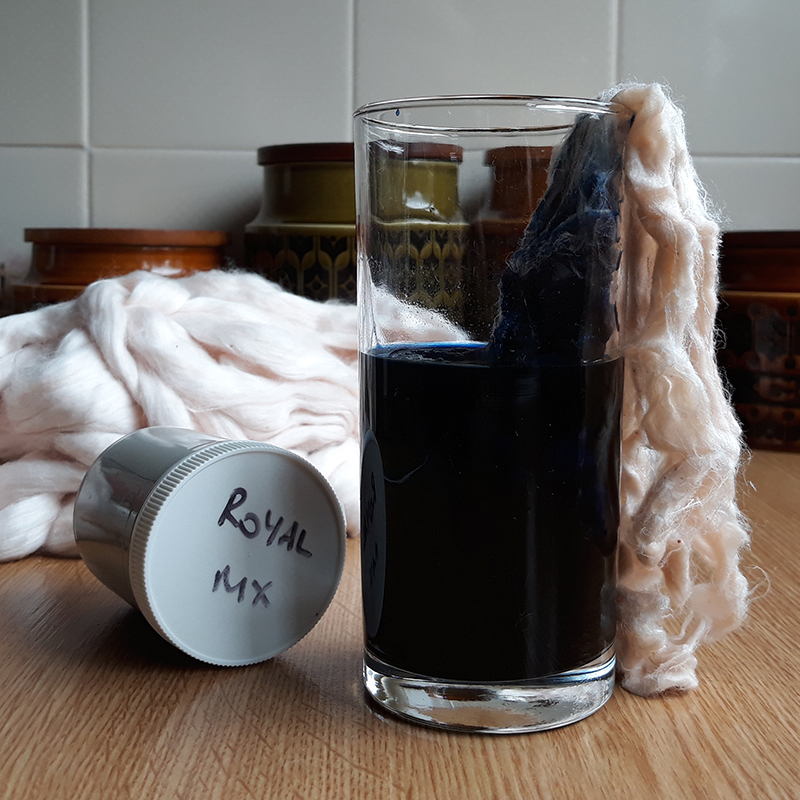 The super soft Dye-Lishus Cotton Sliver can be handspun as it is or it can be blended with another fibre before spinning. If the dual fibre yarn is then dyed (without a fixative or mordant) the dye will remain permanent on the Dye-Lishus fibre only. Before dyeing the cotton sliver it is necessary to pre-wet it. This helps the dye solution to migrate evenly throughout the fibre. 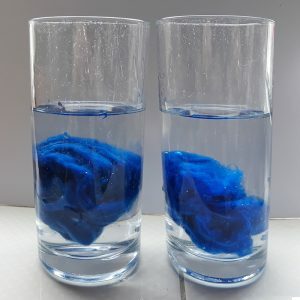 Dye-Lishus Cotton Sliver is sold as Prepared for Dyeing (PFD), however oils and dirt may have transferred to the fibre during handling and this will also effect the absorbency of the dye. The cotton sliver was washed in a bowl of warm water containing half a teaspoon of Synthrapol and then rinsed in clean water. The cotton fibre is fully wetted when it no longer floats. The fibre was then squeezed and set aside. The Brazilwood dyed Dye-Lishus Cotton Sliver shows different shades of red and purple. 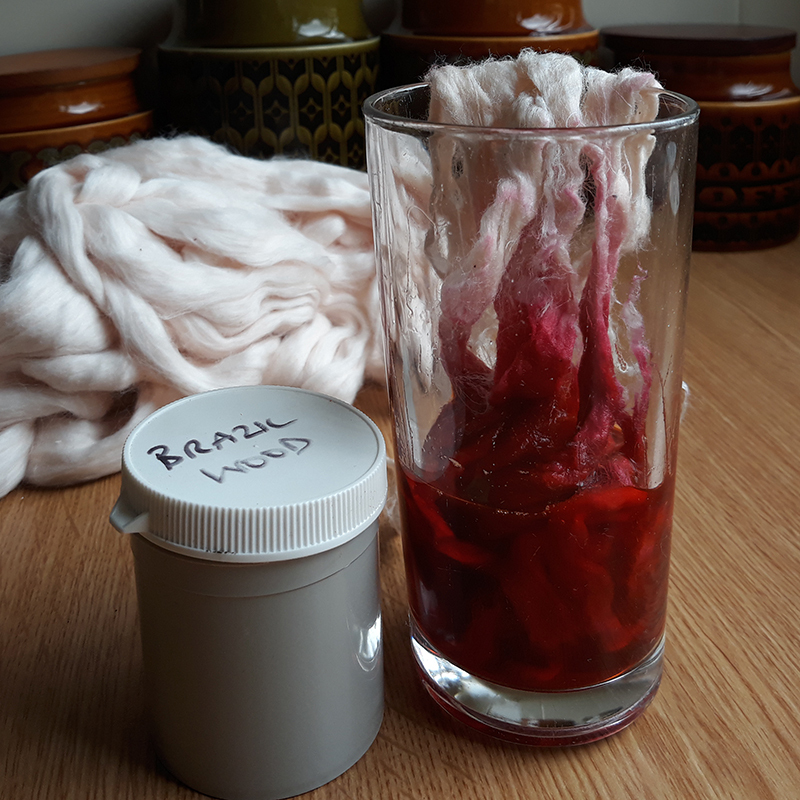 This is because the undyed end of the fibre sample was squeezed out with the dye sodden end of the same sample and some of the colour transferred. 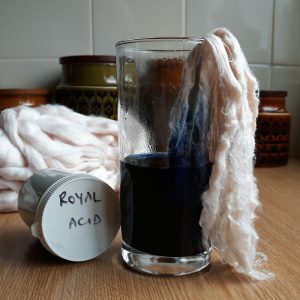 The dye only came into contact with the undyed fibre for a couple of minutes and demonstrates the effectiveness of dyeing Dye-Lishus without additional chemicals. The Procion MX dye sample was treated the same way and the blue transferred almost evenly across the undyed part the fibre sample. 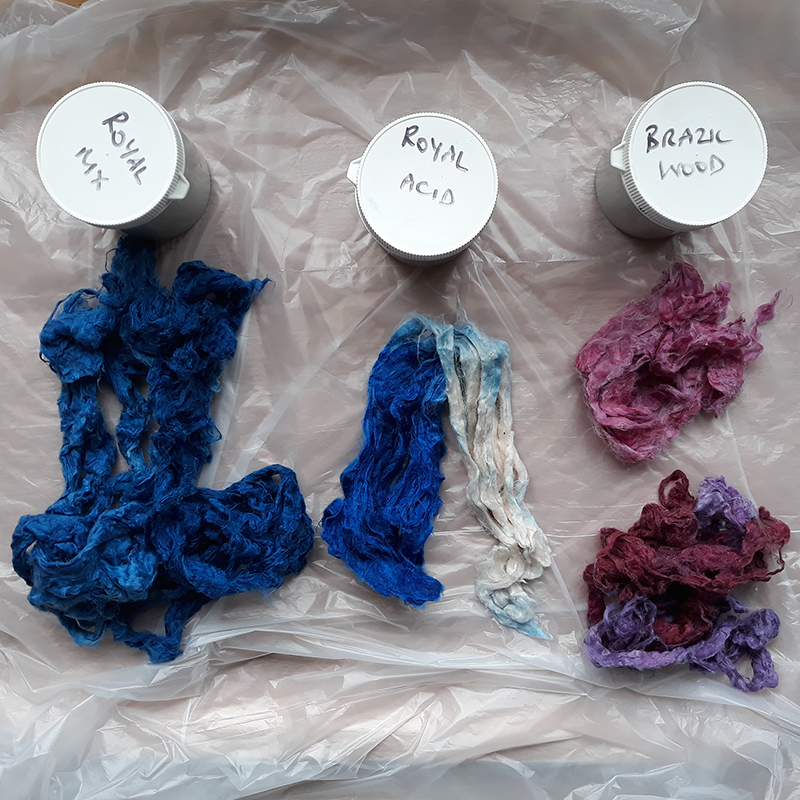 The colourful photograph below shows the Dye-Lishus Cotton Sliver dyed using (left to right) Royal Blue Procion MX Dye, Safflower Natural Dye, Royal Blue Acid Dye, and Brazil Wood Acid Dye. Dye-Lishus Cotton Sliver offers opportunities for experimenting with all dyes, including food colourings. The most exciting result was the colour variations achieved by the Natural Dyes. 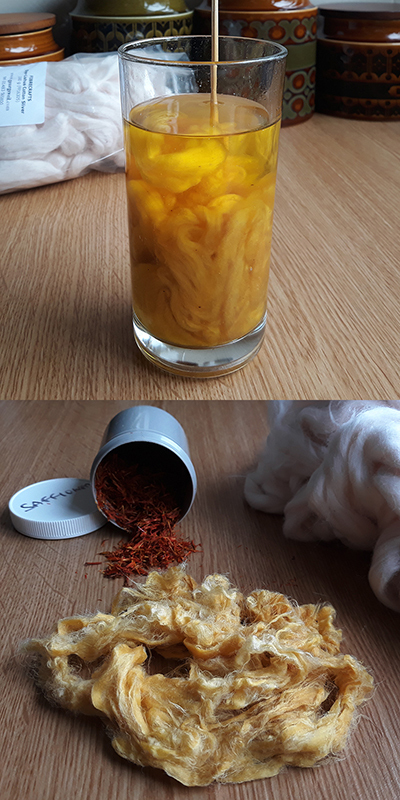 The Safflower Natural Dye was prepared in exactly the same way as the Brazilwood but the cotton fibre was submerged for only a minute. The surprising result was a subtle shade of yellow which did not wash out. To repeat batches of consistent colours, it is a good idea to take exact measurements and timings and record them in a notebook.